Continuing its North American run, 2017-18 Topps UEFA Champions League Match Attax offers collectors a game-based trading card set that taps into the main club tournament in Europe. Display Boxes include 50 foil packs and Midi Tins add one exclusive subset with 15 cards. Just as with the 2016-17 set, there are multiple formats. However, 2017-18 see some tweaks to both the options available and the cards in the set. Among the card choices in 2017-18 Topps UEFA Champions League Match Attax are Bronze, Silver and Gold Limited Edition cards. There are also boosts in the form of Defensive Dynamos and Hot Shots sets. UCL Legend XI highlights the greats of the game while Ultimate 100 Club sticks only with current stars. 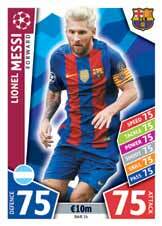 More options for the 2017-18 Topps UEFA Champions League Match Attax set come with 2016-17 Winners and Man of the Match cards. There is even a shot at some very rare Gareth Bale Autograph cards. Please note these are mock-up images. Contents and designs are subject to change. 2016 2017 Topps Match Attax English Premier League Soccer Cards Starter Kit.